PhatWare has released WritePad 4 for iPad. The handwriting recognition app now includes a better input method and support for an external keyboard and mouse. 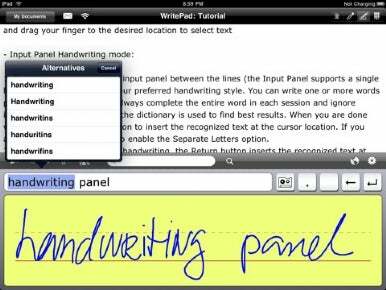 WritePad is a comprehensive note-taking app, originally available for the iPhone. It lets you write on the screen with your finger or even a stylus if you’re longing for the days when the PDA reigned. The handwriting recognition technology then translates your scrawl into text that you can edit or use in other apps. As you'd expect, the handwriting recognition gets better the more you use it. You can write anywhere on the iPad's screen, or you can use the new input panel which gives you a dedicated handwriting space where the onscreen keyboard usually is. Your writing is then immediately converted to text. PhatWare says the new input panel helps improve accuracy of the handwriting conversion. The built-in spell checker also includes an auto-corrector and a shorthand feature that lets you define words and phrases you use often. With the free WritePad sync, you can send documents to another iPad or iPhone over WiFi. And finally, there’s support for Bing Translator so you can translate text into other 13 other languages. WritePad 4 for iPad is available in the App Store for $10. It works with an iPad running iOS 3.2 or later.